Brett and I hit the local hardware store to get the remaining bits to mount my new flagpole holder. When Colin Hyde and Steve Hingtgen arrived mid-morning, Colin helped us drill and mount it to the power hitch. 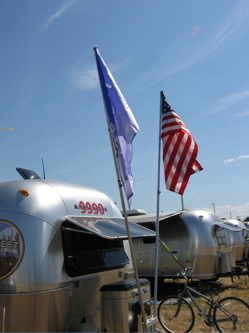 Now I’ve got my two flags flying: one USA, one “illegal” Airstream Life flag. Steve, Brett, Colin and I hung back in the trailer for a few hours, waiting for cell phone updates from the delegates meeting. At noon, we transferred to the Vintage Open House, which was spectacular — one of the best I’ve attended. 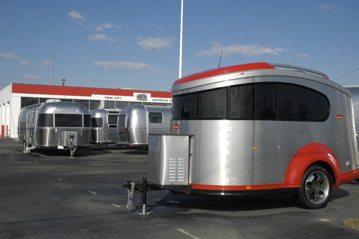 We saw some really good examples of rare Airstreams, including a 16-foot 1953 Trailwind (not Tradewind! ), a 1977 Caravanner (huge living space, no bedroom! ), a 1958 Pacer, several beautifully restored Flying Clouds, etc. The vintage open house was a slightly marred by a poor decision by the management to pump out the trailer tanks at the same time. The odor of black tank wafted over the trailers from time to time … but we were still happy to be there and see the cool rigs. 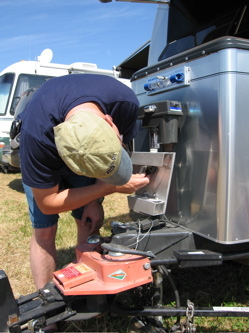 The local press showed up to conduct interviews and Colin reports that he was photographed with his latest project, a 1965 Caravel, wearing his Airstream Life t-shirt. 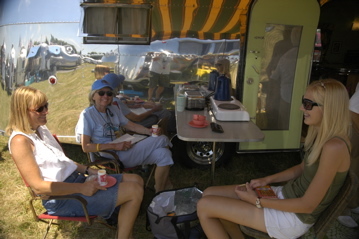 We departed from that at 2 pm to the ice cream social at the new Airstream display area. 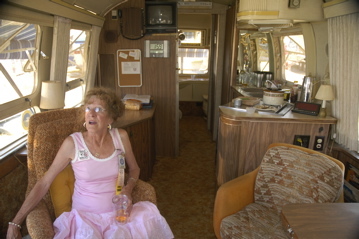 There we found Carol moving into her new 27FB Classic, which is a beautiful trailer. Eleanor and Emma caught up with us there too. 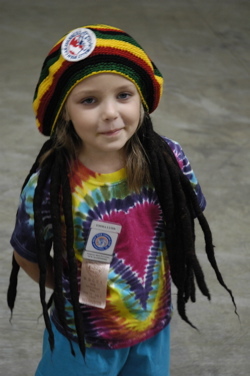 Emma had been playing with friends all morning. I guess free ice cream will do that. Adam and Susan called at 3:00 to say they were heading in, so Brett and I pedalled over to meet them in the bullpen. They ran into another parking SNAFU: the parkers, thinking things were quiet, had quit for the day. We found our friend Robert Trent there waiting as well. Fortunately, someone showed up and found a few recruits, and everyone was eventually parked. 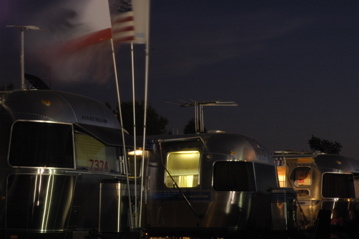 The vote came up … and the proposed name “Wally Byam Airstream Club International” has been rejected. It got 56% of the vote, but it needed a 2/3 majority. At this point, we are still WBCCI and the issue is now dead. The meeting is continuing and they are discussing other issues now. We’re heading off to the Vintage Open House now, which goes to 3 pm. Rich C just called about it and says it’s very busy over there. Wally Byam Airstream Club International? 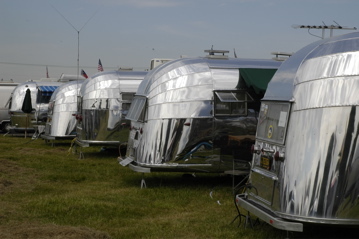 Another update from the floor: an amendment was introduced to change the name under consideration from Airstream Owners Association International (AOAI) to Wally Byam Airstream Club International (WBACI). This vote needed a 2/3 majority to pass, which was 84 votes. The amendment passed with 85 votes! The Base Camp is In! I just got a call from the delegate meeting: 4,557 votes in favor of accepting owners of the new “Base Camp” trailer into the WBCCI. 1,835 votes against, and 242 abstentions. Congrats to all new and future owners of the Base Camp! Welcome! Well, I heard the “Save Wally” crowd had a big party last night. I’m not sure what happened there, but I’m going to get reports later today for sure. I called Colin this morning at his hotel and he was still sleeping, despite supposedly being on Eastern Time. Correlation? I’ll find out. I hope not all of them oversleep. The delegates meeting starts at 8:30 a.m. Pacific Time, which is 30 minutes from this post. The smart people I’ve spoken to expect two things: (1) endless and tedious debate, with considerable input from the well-organized “Save Wally” people. (2) no name change will pass, since it would require a 2/3 approval from the delegates. It is unlikely there is enough consensus on any particular name for that. As to why there isn’t much news coming back from those folks: we’re having too darned much fun. Internet access at this rally is the best we’ve ever had, which is not saying much, but still an improvement. There’s wi-fi in one of the buildings, and cellular coverage is rock-solid here. I’ve seen Sprint, Verizon, and Cingular setups rolling along very well. But who wants to sit in front of the computer when the sun is shining and there’s a party at every fifth trailer? Vintage happy hour was tremendous today, probably the biggest turnout yet. I think nearly a hundred people were there, spilling out from the edges of the tent. There’s a lot of talk about the name change, the state of the vintage club (there’s some political issues there), the Vintage Advantage newsletter (which will have a new editorial team soon), and all the cool trailers here. We’re all looking forward to the vintage open house tomorrow from 11 to 4. The delegates meeting is scheduled for 8 to 12, which is causing some grief for vintage owners who have a strong interest in attending the meeting. I’ll be in touch with some people who will be attending, via cell phone, to get updates. Everyone is starting to hit the wall now… and yesterday was only the first official rally day! The problem with these rallies is that if you try to see everyone and do everything you want, you’ll wear yourself out. I’ve alluded to this problem before. I usually come out of one of these things needing a vacation. The schedule is brutal, albeit self-imposed. We’re all like a bunch of 5-year-olds who don’t want to go to bed because we might miss something. So we get up early and immediately start socializing, run around all day attending seminars, meeting friends, attending happy hours, catching up on gossip, eating out, buying stuff, and then of course eating ice cream. By the end of the day, we’re all beat. I had warned Rich C about this before he came, and last night we were commiserating on it. He ended up doing a bunch of free consulting to people with computer problems, and at one point his voice started to go. I had impromptu meetings with at least half a dozen people, and ended up missing a couple of events entirely because my schedule was completely whacked. Then I had to get back to the computer to respond to email and put up the blog. At 9:30 pm I was hiding in Rich’s trailer trying to unwind with one of his recorded episodes of “Futurama” but there was no escape: people kept dropping by to chat. Eleanor and Emma were similarly tired. I hardly saw them all day, since they kids’ program kept them busy until nearly 3 pm, and then we split up again later in the afternoon. Just when I was dragging myself, Eleanor, and Emma back to our trailer at 10 pm for bed, I spotted a beautiful crescent moon rising over the Airstreams. So I grabbed Rich C’s tripod again and took a few pictures. The moon didn’t come out well, but I did get some halfway decent night shots. We finally got to bed around 11 … and this morning it begins again. Today will be busier! Rich C and his neighbor were asking if I was going to enter the photo contest, but I feel I should exclude myself. Being a semi-pro (since I shoot for the magazine all the time), I think I have a bit of an unfair advantage. I have shot probably over 10,000 photos of our Airstream and our adventures in the past nine months and kept over 4,000. As a result, I’ve got a few good ones and they sometimes appear in the magazine (such as the redwoods photos in the upcoming Summer 2006 issue, which you’ll see in July). I wouldn’t feel right entering photos that I shoot partially for professional purposes in this type of contest. But Rich C is off entering his photos right now, and I wish him luck! Colin Hyde is on his way over right now. He and Steve Hingtgen of Vintage Trailer Supply flew in last night and are coming down from Portland. I’ll meet up with them later this morning.